Here is the first pop-art floral pattern from Chance Glass called Canterbury and on a round fluted plate with gilt edges. 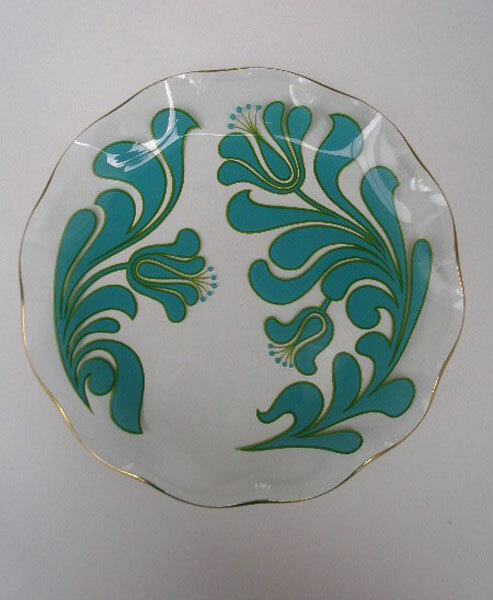 Introduced in 1971, this psychedelic flowery pattern has become one of the more collectable designs from Chance Glass since it is quite scarce. It looks brilliant on display or in use. A fabulous piece of glass. CONDITION: No chips,cracks or fleabites but there are some very, very minor scratches to the centre of the plate which are too small to measure and are only visible when held to the light. They probably come from its use as a cake plate. This is in very good order.